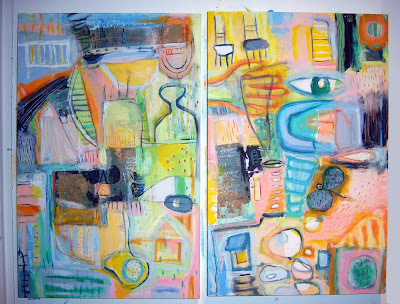 Here's the other diptych I just sent off to the show at UVA. I know... I know... this is a lot of black for a gal like me. I'm trying to stretch myself. And I love the black, it reminds me of my linocut prints. 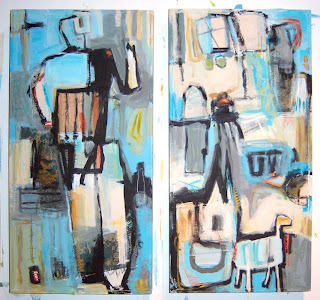 He loved rocko rain or shine Each panel is 12” x 24” x 2”. Mixed media acrylic – including: canvas, book collage, graphite, crayon and oil pastel on wood panel. Price $800 for both. They will be hanging at the show starting September 5th. Please contact me at melissa@mphackmann.com if you are interested and I will put you in touch with the curator. how she taught her garden to sing is one of my newest pieces. Inspired by a a view of my mom's amazing garden and a deadline. I was invited to participate in a group show next month at the University of Virginia. The criteria was to incorporate the book British and Foreign state papers that was sent to me. Well, that book was produced in 1888. Not terribly archival or in good condition. So after much consideration (playing with the crumbling pages) I decided to rip the cover book cloths off and use them in the paintings as collage elements. For those of you looking close enough - they are the dark blue and brown portions of the painting. how she taught her garden to sing Each panel is 18” x 28” x 2”. Mixed media acrylic – including: canvas, book collage, graphite, crayon and oil pastel on wood panel. Price $750 each. They will be hanging at the show starting September 5th. Please contact me at melissa@mphackmann.com if you are interested and I will put you in touch with the curator. While I was anxious to get going on these paintings for the upcoming show they were also a great excuse to test out a few new approaches for my upcoming mixed media class at Arrowmont School of Arts and Crafts this fall. In addition to carving into the wood with my printmaking tools, I incorporated paint, oil pastel and collage into both the canvas and the wood surface on these... It was fun to work into the wood surface as well as on top of the wood. This is just a peek at my mom's amazing garden. You should see this thing - it's unbelievable. I think my paintings take a long time to work on until I watch her out there in the heat fighting off the bugs, deer, weeds, moles, an occasional turkey and bunnies in that garden day after day. Sing Garden Sing!